Mary Ellen Malloy will be guest speaker at the Aug 7th lunch meeting. Mary Ellen is a long-time volunteer at Katy’s Kloset and a member of the Board of Directors for Team Up. 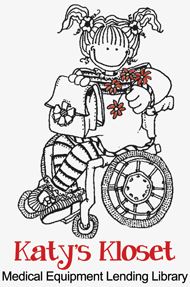 Team Up With Families was formed in 1996 with the intent to sponsor a day camp, hold some family activities for kids with disabilities, and to create a year-round medical equipment lending library, named Katy’s Kloset. All Team Up and Katy’s Kloset activities are carried out 100% by volunteers. Katy’s Kloset began with moms who took their children at New Berlin Therapies, receiving speech, physical, and occupational therapy services. These moms often exchanged equipment with others as their kids outgrew a piece of equipment. When this group decided to form a non-profit, Katy’s Kloset became a reality. It became a place to donate equipment that is outgrown or no longer needed and to loan out to those who can benefit from having that equipment. In the early years it was very small, and the founding group never imagined what it has become today. 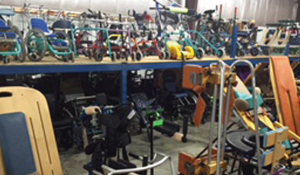 In the beginning, it was only children’s equipment, but over the years Katy’s began accepting donations of adult equipment and loaning those items out as well. Currently, Katy’s Kloset loans out about 900 pieces of equipment each month to individuals in the community at no charge. In addition, many supply items are donated and given to individuals who request them, such as incontinence supplies (Depends), wound care, gauze, ostomy supplies, respiratory items, etc. About 25 volunteers help clients on open days, and several volunteers are at Katy’s Kloset nearly every day to process donated equipment and supplies to make them available to clients to borrow. Katy’s Kloset currently rents three adjacent warehouse spaces to manage these large quantities of donated equipment and supplies. As an all-volunteer organization, the main expenses are rent and utilities for the warehouse.